Saoirse had a great hospital stay. 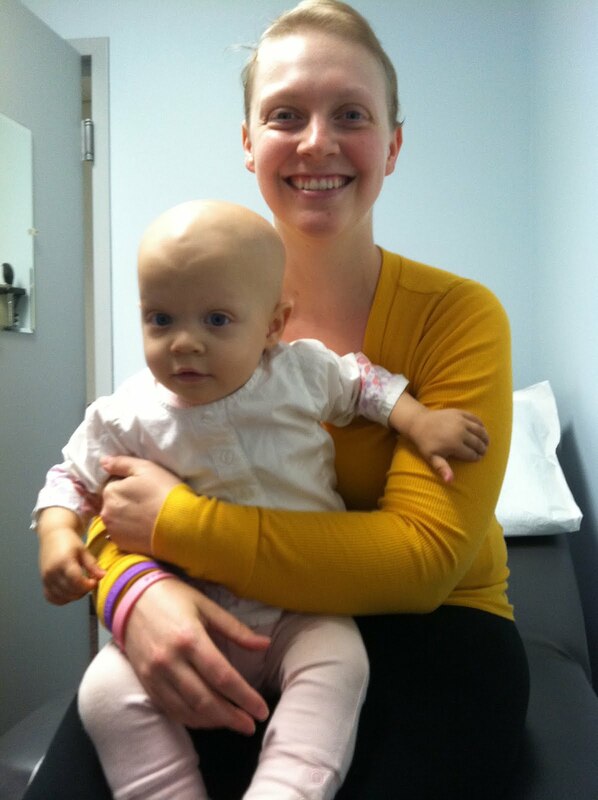 She took on this chemo like a champ, and was her usual fun loving self the whole time. She even made two lovely paintings in the play room, and did a nice job of decorating herself in the process. The pictures are now hanging on our fridge in the kitchen. While we were in the hospital, we had a meeting with a woman from the innovations department, and the writer of the VECTOR blog. We are working on developing a product to help patients and parents better care for the external lines that many of the oncology patients have. We are hoping the innovations department can help us make some connections with people who can help us develop the product and business, and set us in the right direction for getting the mass produced. We also hope that an article in the VECTOR blog will help us get some exposure once we are up and running. This product has helped us so much while caring for Saoirse's lines, and the patients and parents that have tested them for us, as well as all our doctors and nurses, love them too. This could really help a lot of people, and we are really looking forward to developing a business that we are passionate about. I was finally starting to feel better this week. I even had the energy to walk the dog one morning, and walk around Rockport and swim at the quarry another day. Then, out of nowhere, I broke out in hives. I had a huge patch on my lower back last night, and they were quite itchy, but not terrible. I took a couple Benadryls, and when I woke up the ones on my back were pretty much gone, but they had spread to my legs. I kept taking the pills, but over the day it has gotten progressively worse. At this point, I'm just hoping to get through the night and morning without having to go to the ER so I can go to my regular doctor tomorrow. Arg - if it's not one thing it's another. They are just so darn itchy! And, I have no idea what's causing them. Gotta love new mysteries. I didn't have anything else to do this week anyway. Hopefully they will be gone by tomorrow so we can go camping later this week! Just read your story in Brazil press. You both already have my prayers! I have two kids: a girl named Luisa who is 3yo and a boy named Miguel who is 8mo. We loved Saoirse! She's so cute! Hope all ends fine! I heard about your story and I'm sending all my good energies to you! Both of you will get better pretty soon! May God enlighten their hearts, because you two are in my prayers. I live in Brazil and his story moved me. Force that will conquer! Brazil is with you now! I love your corage to face this challenge! God bless your whole family and make you overcome! Your daughter is so cute! I agree with Bruno, Brazil with you!!! I'm so excited about you corage and your family and about everthing! I wish so much god bless you and your baby daughter! Yes, I believe everything is gonna be alright! I'm so sure that! Kisses and more kiss for you and for you and for your girl! Have faith dear, God is the doctor of doctors. God is with you. sorry to my English, I'm Brazilian. kiss on the your heart. I think a warrior because they face a cancer and also support a baby is very difficult.i from brazil n i'm praying for u n your baby! As my fellow Brazilian I am here to give you more incentive to this life challenge, I have a kid that had Wilms Tumor when he was born. We passed for 1 year and half by chemos and radioterapy. The guy is a very special kid under GOD teachings. Hi Kezia! Both of you will get better pretty soon! I have 2 daughters - Julia 10yo and Luiza 4yo... I can´t imagine this happen to us... But if it happens one day, I´ll think about you and your beautiful daughter to give me courage. You and Saoirse are very courageous and strong! Hope all ends fine! Brazil is with you now! I read about your battle through the press here in Brazil,i identified myself enough I'm having a similar situation in my home, my dear mother was detected with leukemia, is a battle that involves everyone, but we can not never give up, I wish all the luck for your family, and have faith you and your beautiful daughter will win this battle together. olá Kézia, ao ler sua história não podia deixar de dizer, que estamos orando por vocês, existe um único Deus soberano que pode fazer novas todas as coisas, ele deu vida novamente a minha mãe por um milagre, tenha fé, tudo é possível aquele que crêr, bjs!!!! Bem, moro no Brasil...e fiquei emocionada Kézia com a sua força de vontade, determinação... tenho fé que vocês vão se curar....continue com essa alegria de viver, e continue passando isso pra sua filha!!! Vocês com certeza são uma família abençoada!!!! Muita Luz!!! Brazil is with you now! God bless your whole family and make you overcome! Hi kezia.... I am a mom, and reading your posts made me feel so, so very proud of you. Thank you for sharing it with us, and making it an example of joy, braveness, and trust. I am sure you and your baby will win this battle, and in a beautiful way. Wish you 2, lots of love, lots strenght, lots of joy, lots of sunny days, lots of courage. I am including you in my prayers, and hopefully all this energy will come your way. Kisses from Brazil. Dear Kezia, cancer is a terrible thing made from hell by evil. But thanks God, through Jesus, there is a healing. I will pray for you and your daugther. I believe for sure, you are going to get rid of this evil. In the name of Jesus, I pray for healing for you lives. There is no impossible for my God. Strength for this moment. Kisses. Eduardo. Não tenha medo, e confie sempre em Deus, pois é Ele que Em nome de Jesus irá curar a sua Filha e você. Thank you for been a example to all peoples around the world. Hi dear! I'm from Brazil and i've just read you history. I think you're amazing.. not many of us has the strenght you have every day. Everything will be ok.. at least, if depends on my prayers. I saw your story in the website with news and Brazilian mother Brasil.Sou você.Quero like to know that I and my family are hoping that you and your daughter defeat this disease. I too went swimming in a rock quarry and have been suffering from hives for over a month since. Very itchy. Any luck with treating yours yet?